Home » Posts Tagged "Solar Energy Costs"
Posts Tagged "Solar Energy Costs"
Srinergy helps Congregational Church of Birmingham become Solar Powered! 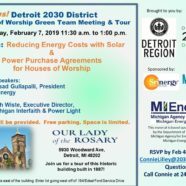 Srinergy Helps Detroit’s Church of Messiah to go Solar! Registration Open! ZNC Series: Does Clean Energy Make Sense for My Business?